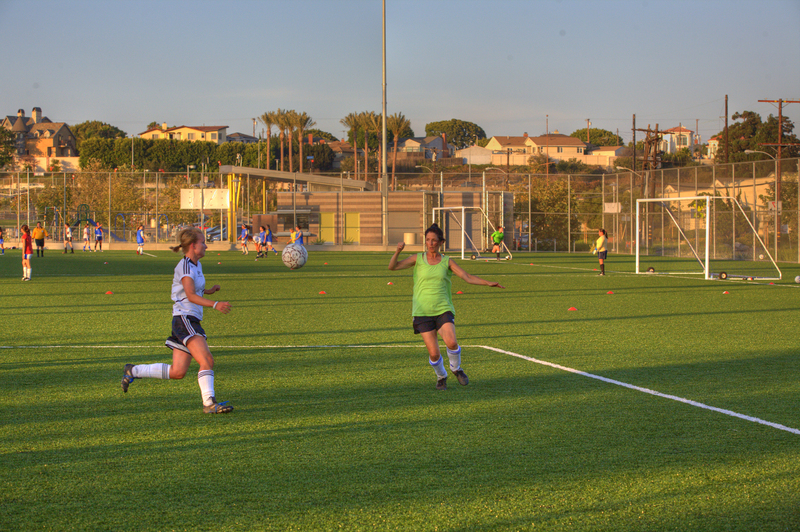 Located next to the Santa Monica Municipal Airport, the Santa Monica Airport Park includes two soccer fields, an off-leash dog park, concession facilities, playground, passive open space, picnic areas, and permeable pavement parking. Newly constructed landscapes need time to mature. With some exceptions, landscape projects typically have budgets that do not allow for the installation of many, if any, large-sized trees or specimen plants and, hence, younger nursery stock is used. Landscape architects are challenged to design with consideration of a project’s aesthetic and functional value immediately upon construction and the long term consequences of time and maintenance practices. After an appropriate time, we often return to our completed projects to see for ourselves how they have held up. As landscape architects we’re pleased when a design achieves its intended goals, but equally pleased when we discover the landscape re-invented, functioning in a somewhat different way to better serve the needs of the people who use it. Santa Monica’s Airport Park opened in 2008 and its dog park has become a popular socializing area for animals and their owners. I am a regular user of a public park which our firm designed. The Santa Monica Airport Park opened in 2008, and at that time it was the first new park the city had built in nearly three decades, drawing the attention of several divergent special interest groups. From my perch at Airport Park’s dog park, I have observed the park’s maturity beyond its plant palette – which, by the way, has had some modifications. As a community space the park has held up to the original design intent and much more, becoming a popular destination for soccer matches, family celebrations, community group gatherings, picnics, children’s play and, of course, dog play. Among the park’s unexpected surprises for me are the establishment of new friendships which would not have occurred without the creation of this public space. The park also has a wider reach than we originally anticipated. For example, owners of specific dog breeds hold monthly meet-ups at the park which are announced through social media, a technology emerging since the park’s inception. On a recent visit to the park I heard a group of people complaining about the lack of parking on weekends and how far they had to walk to get to the park. I smiled. This landscape has become a social routine for people, one worth an extra effort.